Minister for Far East Development and the Russian President’s special envoy to the Far Eastern Federal District Viktor Ishayev talked to RBTH about completed projects, modernization plans and investment opportunities of the region. Last year, the government turned the vector of Russia’s development eastward. The APEC summit was held in Vladivostok, a ministry for the region’s development was set up and a reorganisation program launched. Minister for Far East Development and the Russian President’s special envoy to the Far Eastern Federal District Viktor Ishayev told RBTH about completed projects, modernization plans and investment opportunities. Russia Beyond the Headlines (RBTH): You have always said that the Far East merits particular attention. Is it getting the much-needed attention now? Viktor Ishayev:One might say so, the most important sign being increased financing. Last year, the government allocated $2.3 billion (70 billion roubles) to the region, whereas in the early 2000s they allocated no more than $35 million (1 billion roubles) for 13 regions. The Ministry for the Far East Development was set up six months ago. We are working on a new state program and a draft law to turn the region into a front-runner rather than a laggard. The Far East is already more efficient than the Russian economy on average. The average gross regional product (GRP) of the regions in 2011 was $13,700, while in our Region it was $17,500. We did not stop growing even during the crisis. It is another matter that the Far East today lives by selling commodities, with hydrocarbons accounting for 90 percent of our exports. That has to change. For instance, we should build gas liquefaction plants, like on Sakhalin, and then offer this product to Japan and South Korea. We should open fish-processing facilities using Japanese and Chinese technologies and specialists and sell them fish in tins, not beheaded frozen fish, like we do now. RBTH: Is this being done with the interest of foreign partners in mind? V.I. : It depends on the sector and the country. For example, Japan needs gas, their company Sodeco has invested in a liquefaction plant on Sakhalin where it owns a 30 percent stake. Rosneft, an Indian and an American company own the rest. In 2009, a total of $2.6 billion dollars was invested in that enterprise. The Japanese are showing an interest in gas fields in Yakutia, in Irkutsk. If another plant is built in Vladivostok, they might be interested. The Chinese have a tougher policy. They have a clear target of taking the bioresources of the Far East at all costs; they buy fish stocks in our seas at fixed prices and process the fish at home, creating jobs. They are implementing a program for developing their North-East into a dynamic region. During his recent meeting with Hu Jintao, Vladimir Putin suggested that production be moved to our side, but so far China has not budged. Construction of a gas pipeline to South Korea is being planned. This pipeline, incidentally, will go through North Korea and will collect about $100 million in transit fees. I must stress that this is not a three-way agreement. The Koreans are also involved in the modernisation of the Zvezda shipyard at Bolshoy Kamen. We are building a dry dock to build a new class of ships: gas carriers and platforms. But the amount of foreign investment is still small and, with rare exceptions, the investments go into the commodity sector. RBTH: What other sectors, in addition to commodities and ship-building, are you planning to develop in the Far East? V.I. : First, we have to put in place a transport infrastructure and launch container haulage. So we need to modernize the Trans-Siberian Railway and build the BAM-2 railway. That line alone will carry 180 million tonnes of freight a year. Second, with such major markets as Japan and China on our doorstep, food production may become a spearhead industry. The Far East has not only fish, but also vast land resources. The Far Eastern District occupies 36.1 percent of Russia’s territory, but we must develop it, open canning factories instead of simply leasing our land to foreigners. We should build factories that process timber into high-quality paper pulp. Last year, Mazda opened its first assembly point in Russia, but I don’t think it will develop into an automobile cluster. Car manufacturing is more expensive here than in St. Petersburg because of the high logistics costs. RBTH: What is being done to attract investors to the Region, in particular those that will start building industries? V.I. : We have studied the experience of various countries and found that the first thing to do is to cut the time it takes to open a new business. So far, it takes two or three years just to allocate land for a factory, but actually the procedure should take six months at most. In addition to that and mandatory tax breaks envisaged in our draft law, we are putting together package offers. Every project is negotiated separately. 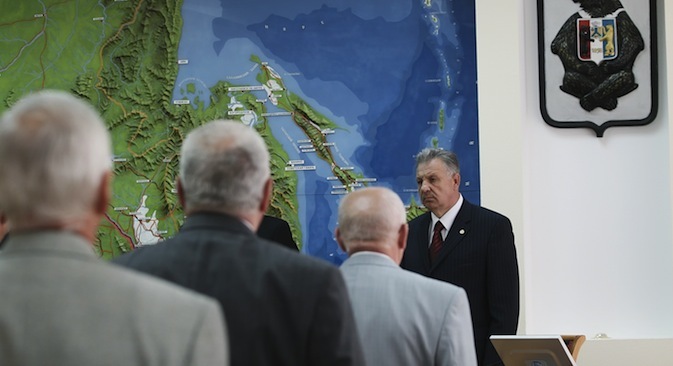 Japan is interested in the Elginskoye Coalfield. We are not against it but are only interested provided they simultaneously finance infrastructure development, such as road-building. We look forward to mutually beneficial cooperation. I will take part in the Russia-Japan Forum in order to continue a constructive dialogue on various options for joint work and for strengthening our links. Mutual trust is the key factor for successful cooperation. Nobody would invest in a project, region or country it did not trust. Our task at the Forum is to present the Far East and show what it has to offer. Japan is ready to invest in Russia. We want our partners to see for themselves that it makes sense to bring their money here. RBTH: What do you think is the optimum ratio of foreign and domestic investment in the Region? V.I. : The picture today is as follows: the state gives about $3.3 billion (100 billion rubles) and investors contribute five times that sum. Only 10 percent of investments are foreign, the rest being Russian or offshore-registered Russian investments. The Far East development program needs twice as much. RBTH: Is Russia’s investment image a factor encouraging potential partners to develop their business here? V.I. : Russia’s problems are no secret: corruption is rampant and the Far East is no exception. Of course, we have to combat this. Explaining our situation is one of the tasks of the Russia-Japanese Forum. RBTH: Do you think “the Chinese threat” is real? RBTH: Does India have any projects in our Far East? V.I. : So far only in the oil and gas sector. For instance, the Indian company ONGC Videsh Ltd owns 20 percent of Saklhalin-1. There are some other projects. In the future we would be interested in cooperating on medical supplies. Viktor Ishayev is Minister of the Russian Federation for Development of the Far East and the Plenipotentiary Representative of the Russian President to the Far Eastern Federal District.